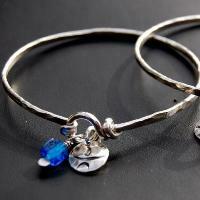 Artisan crafted, sterling silver bangle with a knot clasp. It is easy-on and easy-off and fits most wrists. It is accented with a hand stamped sterling silver Chalice medallion. Beads will be gemstones, recycled glass or pearls.